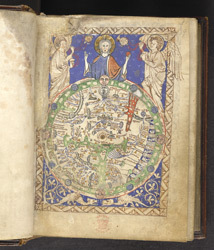 This Psalter is famous for, and named after, its full-page miniature of a map of the world, which is related to the famous medieval map of the world (Mappa Mundi) at Hereford cathedral. But it also has a series of full-page miniatures of the life of Christ, added late in the 13th century; historiated initials at the usual psalter divisions; and an unusual image of the Virgin and Child. The calendar and other features suggest a London/Westminster origin, and the presence of the feast of Richard of Chichester, canonised in 1262, provides the earliest possible date for the production of the book. Beneath a blessing Christ and two censing angels is a remarkably detailed map of the world. Jerusalem is in the centre, the Red Sea is coloured red, and depictions of mythical monstrous races are arranged along the lower right-hand extremity. The British Isles are at the lower left extremity.